Modern with the Twist of Elegance, is the theme of my newest scarf in the new Elegance Collection (coming soon). 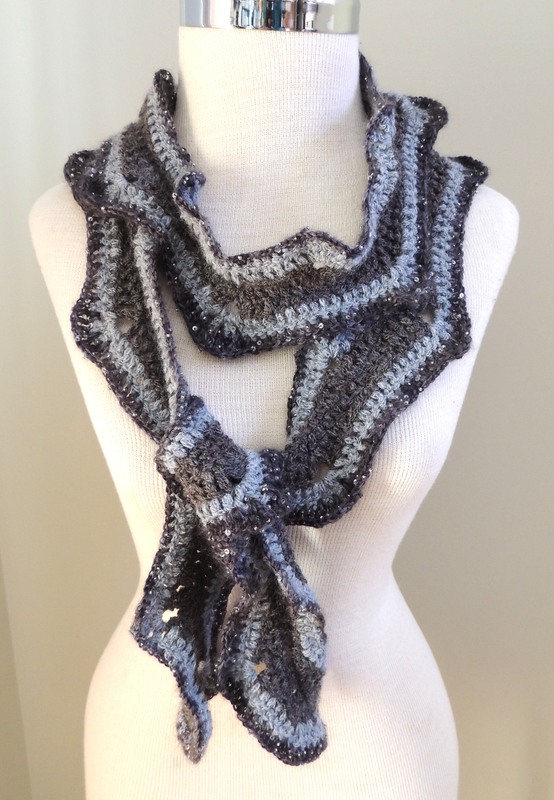 I started this scarf with the thought that I wanted something new for myself to wear for Fall and Winter that had a more modern and elegant tone to the design. 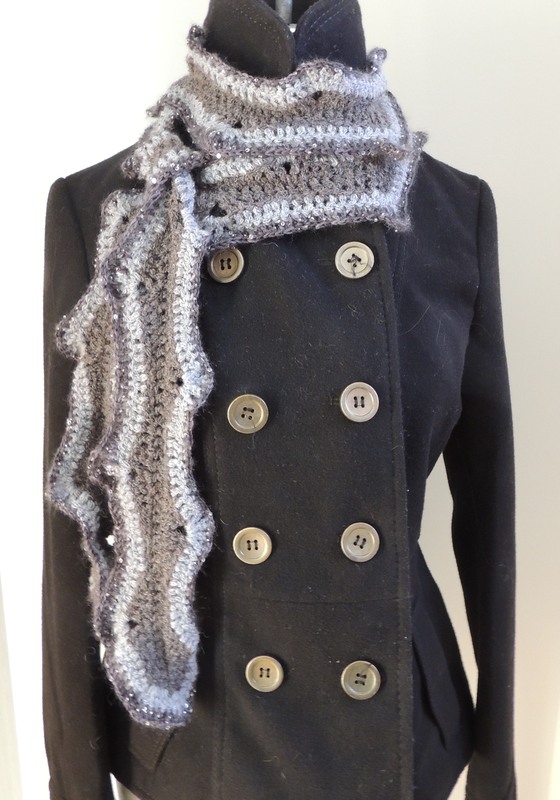 A longer scarf that was still thin so I could use it as an accent scarf on a shirt or sweater or as a fashion scarf on my leather jacket or more formal dress coat. A multi tasking scarf to suite my many goals above yet add a modern and elegant feel to make me feel a splash of something special when I wore it. Starting with a beautiful yarn called Rowan Lima and ending with another amazingly wonderful yarn to work with called Art Yarns, the bling in this case. Rowan Lima is 84% Baby Alpaca, 8% Merino Wool and 8% Nylon. 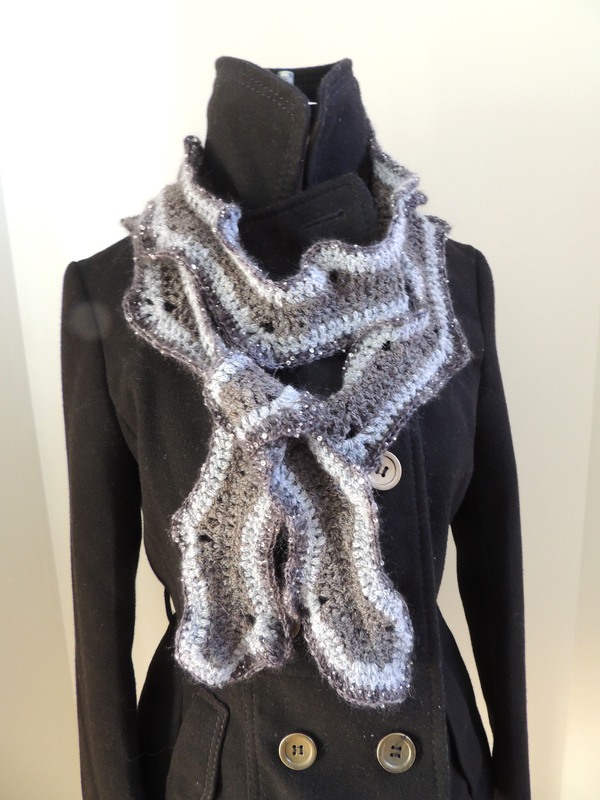 The Lima is very soft yet strong as there is a chain construction in the yarn. The colours are soft and make a great textural statement. I enjoyed working with the Lima and will definitely be using it in the future. I wanted the scarf to be neutral to go with most of my wardrobe so I choose colours accordingly. 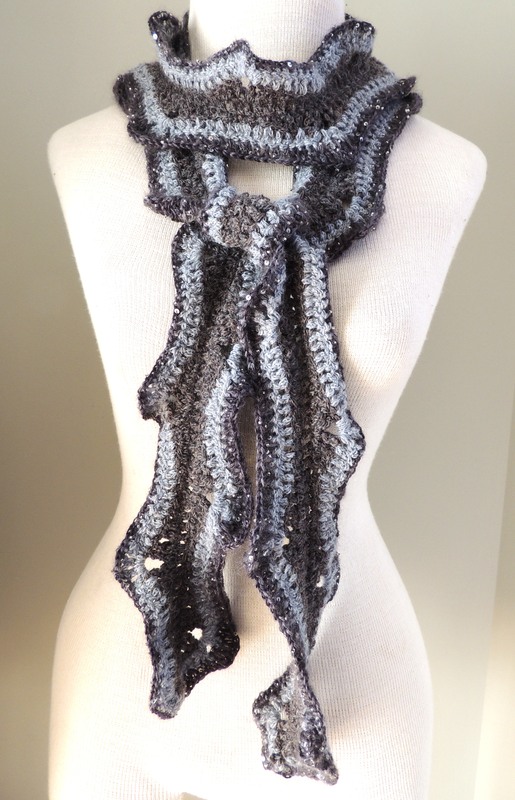 On to adding the final touch to the scarf, the Elegance, a touch of sparkle. I decided to use the stunning yarn by Art Yarns Beaded Mohair and Sequins made with 60% Silk, 40% Kid Mohair with glass beads and sequins. This yarn is wonderful to use when you want to add that special touch or a bit of sparkle and elegance to your designs. The hand dyed colours are luscious and the yarn is luxurious to the touch. Check out more of their yarns at www.artyarns.com or buy at your local knitting store. The Modern Elegance scarf can be worn in many ways as it is really quite long and can be wrapped around twice if you like making a neck warmer or once as shown worn in various styles. The colour way is gentle, but still makes a statement at the same time. Designing different styles is always an interesting adventure. A lot of my designs are embellished to add that special touch, but I also love designing elegant and modern designs that show off the beautiful yarns, texture and style of the overall design. Try making something new that you haven’t made before, you might find you really like it! You can purchase both of these wonderful yarns locally in Edmonton, Alberta, Canada at http://www.rivercityyarns.com. View more of my designs at www.vbaberdesigns.com or www.intricateknits.etsy.com Enjoy your day!